Check out how Trane XR heat pump series with the advanced Climatuff compressors, Spine Fin outdoor coil and DuraTuff rust-resistant base pan provides a great value for homeowners. With Trane heat pumps, you get a product with over 110 years of experience behind it that gives you the reassurance that you are getting both quality and affordability in one. For years of heating and cooling and for a unit that will blend in perfectly with a complete HVAC system, it’s just like their tag line says, it’s hard to beat a Trane. Trane XR models are mainly designed with one-stage Climatuff compressors, which allow them to work only with the 100% capacity, while the top model XR17 has two-stage compressor which allows operation with the 70/100% capacity. Some Trane heat pumps from XR14 and XR15 also come with sound insulation to reduce operating noise. Another feature that contributes to quieter operation and also better airflow is the fan that comes with the installed blade-down concept. The noise level is in between 70 and 76 decibels. You also get the Spine Fin outdoor coil made completely from lightweight aluminum that speeds heat dissipation and wards off corrosion. The exterior is designed to last as well, thanks to the powder coated paint job that shields the metal from rust as well as the DuraTuff rust-resistant base pan that is designed not to warp or rust. Steel louvered panels on the sides shield the coils from the weather while keeping air movement flowing unimpeded. The case is held together by zinc-coated fasteners that won’t rust or corrode, giving you years of service. The Electronic Demand Control helps cut down on expensive defrosting cycles by only doing so when it’s actually needed. This helps reduction on your utility expenses as well. Trane XR models, when compare to other series comes with a shorter 10-year warranty on a compressor, outdoor coil and internal parts, which is industry most offered. You can combine the Trane heat pumps from XR series with other Trane products and create a complete HVAC comfort system that will maximize the output of all of the products. These include CleanEffects air cleaners, humidifiers, energy recovery ventilators that circulate the air and reduce the need for the heat pump to work so hard, and the Nexia Home Intelligence controller system that you can control and monitor with your smartphone or computer. Trane XR17 heat pumps come with all of the key components needed to have the best heating and cooling possible in this line. If you pair it with other components, you can enjoy Energy Star certification for your products thanks to the two-stage compressor which also means you virtually eliminate temperature variation indoors. The XR17 delivers as much as a 17.25 SEER ratio for cooling and 9.6 HSPF for heating. You’ll be pleasantly comfortable all year long and your wallet will be pleasantly left with money at the end of paying the utility bills. 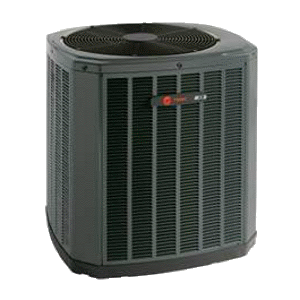 Trane XR16, too, comes with the Climatuff compressor for many years of quality operation, and like the XR17, when used in combination with other Trane products, is Energy Star certified. This delivers a very respectable 17 SEER and 9.6 HSPF cooling and heating efficiency as well. The XR15 heat pump offers the same quality materials as the top of the line XR17 model does but at a slightly lower efficiency rating – 16 SEER when included in a full Trane HVAC system. It can also deliver 9.5 HSPF heating efficiency when matched with a Trane furnace. Those ratings translate into lower utility bills in every season. This entry level model in the XR line still features the Climatuff compressor and Spine Fin aluminum coils, and it is also the most affordable unit. Trane XR14 can give you 14 SEER cooling if it is paired with an air handler unit, and an HSPF rating of 8.2 if it is matched with a Trane furnace. As part of the full HVAC system, it can be a very effective energy sipping unit, but it won’t qualify for Energy Star certification. You’ll still get the super durable case that is made to last, so your new Trane heat pump will be with you for many years to come. If this line of Trane heat pumps sounds like the perfect fit for you, call your local Trane HVAC dealer and schedule an appointment to have an expert come examine your heating and cooling needs. Then just sit back and relax in your comfortable home. If looking for a recommendation… XR17 is our selection as it is high efficient (Energy Star) - SEER rating is 17.25, HSPF is 9.6, is reliable, comes with the two-stage cooling and heating and several other cool features.